Alliance Party leader Naomi Long told BBC Radio Ulster’s Sunday News that politicians can “get giddy on the kind of high of hanging around with people in the Irish-American lobby who perhaps don’t see the subtle distinctions that we are aware of back home”. Ulster Unionist leader Robin Swann called for an explanation, and said the poster was “highly offensive and wrong on so many levels”. “It is sad that whilst others celebrate St Patrick in a respectful and non-confrontational manner, Sinn Féin returns to type,” he said. “For instance, Omagh Protestant Boys Melody Flute Band took part in the Sgt William Jasper Memorial parade in Savannah, Georgia, organised by the US military and including bands from the US Army and US Marine Corps. 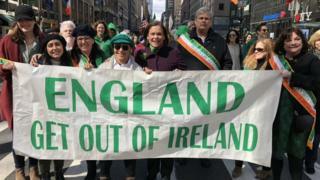 Former Victims’ Commissioner Patricia MacBride told BBC Northern Ireland’s Sunday Politics programme she understood the sign gained prominence in New York in the early 1980s. “I think it came to the fore during the daily protests outside the British Consulate in New York City during the hunger strikes in 1981,” she said. Patricia MacBride said the sign “was very much of its time”.